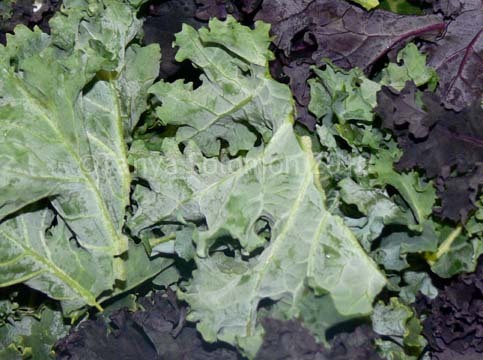 KALE: the most amazing green leafy vegetable! 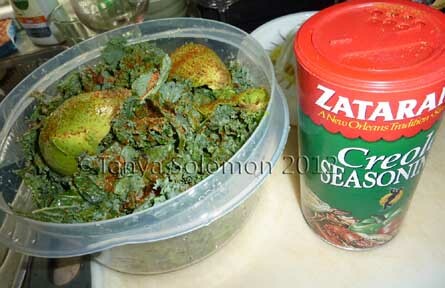 Put everything in a very large bowl, including the scooped out avocado (minus the pit). Wash your hands well. 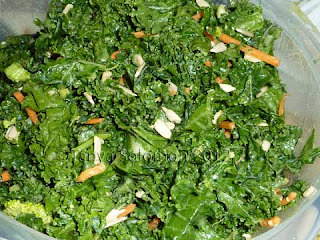 Now massage the avocado and juices into the salad with your hands for several minutes, wilting the kale. Eat! Kale: high in beta carotene, vitamin K, vitamin C, and calcium. Blocks growth of cancer cells. 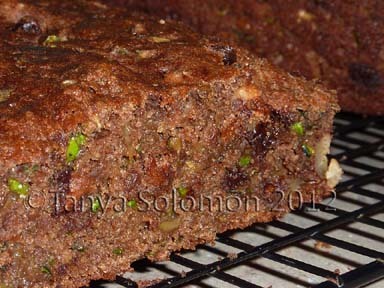 Avocado: healthy fat, rich in potassium and B vitamins, has been shown to lower cholesterol levels. Broccoli: very high in vitamin C, good source of dietary fiber, full of phyto-nutrients and anti-oxidants. Carrot: high in beta carotene and vitamin A.
Sunflower Seed: contains natural anti-oxidants and vitamin E, helps protect skin & mucous membranes. Hemp Seed: High protein, contains all essential amino acids,perfect ration of Omega 3 to 6, good for immune deficiency diseases. I'm not even going to touch that one! At least not in this post.....that's worthy of its own post. 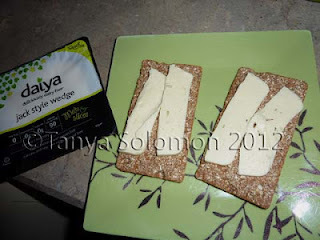 Have you tried Daiya's new wedge cheeses?? OMG. I keep buying the Jack flavor because it's so good. I finally just picked up a cheddar flavor to try. But nothing will beat the Jack flavor. 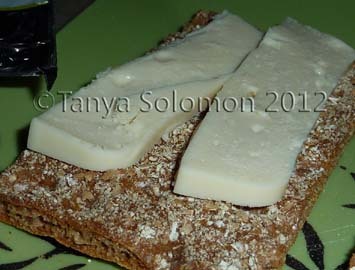 So good on crackers! 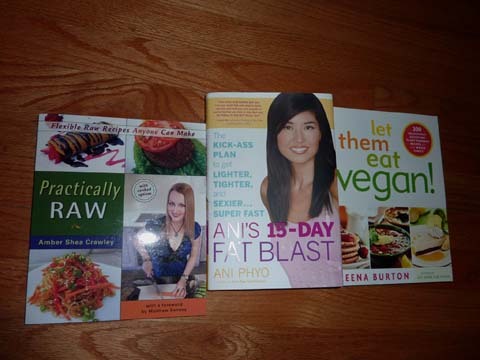 Practically Raw by Amber Shea Crawley, Ani's 15-Day Fat Blast by Ani Phyo, and Let Them Eat Vegan by Dreena Burton. I'll be working my way through those! First, I tried a "Pina Colada" smoothie from Ani's book. My first time using coconut oil! I was very scared of it before. And actually, it was all white and everything before I opened it. Now...in the cupboard, it's totally clear. Is that what's supposed to happen or is there something wrong with it?? Anyway, the smoothie was pretty good, but a bit "sandy" due to the brown rice protein powder I used. Very filling though. 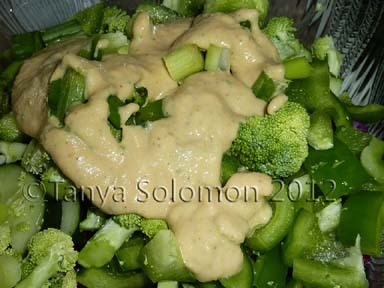 I also made "DJ's Hummus Salad Dressing" from Dreena Burton's book. SO GOOD!! I always liked hummus on my salad, so why not make a dressing out of it? I did leave out the extra oil though. And from Hearty Vegan Meals for Monster Appetites, I made the "Sloppy Jo-Nis". I rarely use TVP, but did finally purchase some. 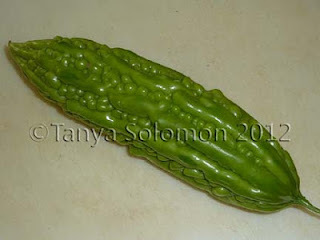 They were really tasty! 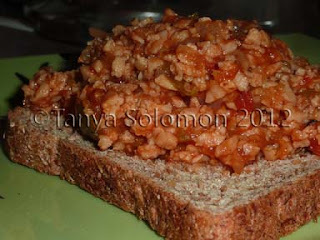 I cut down the amount of ketchup in the recipe (too much sugar) and added pureed/diced tomatoes. I also left out the steak sauce, as I didn't have any. I'll definitely make those again! Well, there you have it. I need to make more recipes from all these awesome cookbooks I have! 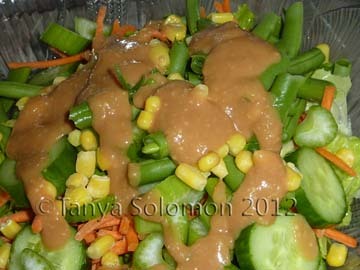 Our standard in this house is salad or steamed/stir-fried vegetables with tomato sauce or an Asian sauce of some sort. We end up eating that most of the week.....is that wrong? Next, I'm going to delve into Amber's book! What good cookbooks have you gotten recently? Do you always make the same thing over and over again?